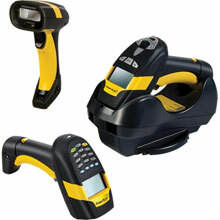 Industrial handheld laser barcode scanner with Bluetooth wireless technology. The Datalogic Powerscan PBT8300 cordless laser scanner is a standard wireless solution that guarantees mobility and versatility in manufacturing and warehouse environments. Compatible with Bluetooth 2.0 wireless technology, it allows direct radio connection between the scanner and the host computer featuring the same standard. The Powerscan PBT8300 scanner mounted on a forklift with a Vehicle Mount Terminal (VMT) provides an excellent solution for warehouse applications. The Powerscan PBT8300 laser scanner represents the final addition to the PowerScan 8000 series, making a complete PowerScan product offering available to meet any reading or radio requirement for the industrial market. The Datalogic PBT8300-ARRK10US is also known as Data Logic	DTL-PBT8300ARRK10US	or PBT8300ARRK10US	.